I had intended to make more use of that, but somehow that hasn't happened. A minor reason is that the JS code was unnecessarily complicated (being my first). More spaghetti plots have been appearing at Lucia's, this time re GCM model results, and there was discussion of how to make them more readable. So I thought it was time to scrub up my old code, and this time make the generation of JS an automatic process that others could use. So I'll give below first the GCM results plots, and then instructions on how to generate it from your own data file. Firstly I should say that I haven't exactly reproduced Lucia's data. I took the files that I used and explained in this post. The various temperature indices are up to 2010 only. I've followed her lead in doing 13-month filtering. I normalised baselines by setting the mean of each curve over the plot period to zero. This is not part of the program, but was done in creating the csv file. So here's the plot. Move the mouse over the legend and the named curves will show in black, with the regression line also showed. Download the R code spag.r. Among the first commands are the definition of a name and a url picUrl (end with "/"). Choose your own name and location where the pictures will be held. Create a data CSV file (all in the same directory) called name.csv. You can do this with Excel or other apps, or just by editing. The first column is the x axis values, subsequent cols are the curves. Each col must have a heading (it's name). In CSV, everything is comma-separated, but spacing doesn't matter. Headings (but not numbers) should be in quotes. Use NA for missing. Run spag.r in R. It will produce name.htm and a set of .png files, one for each curve. They are called name1.png etc ("name" of course is the name ypu edited into the file). Move the .png files to the location specified by picUrl. Paste name.htm into your own html file where you want the plot to appear. For this example, I've posted the CSV file zX.csv. Meanwhile, Arctic ice has been slowly melting. I've added a line on the monitoring page where you can see what minimum will be reached if melting follows the pattern of previous years. The current IJIS JAXA extent is 3,542,000 sq km, which is 749,000 sq km below the previous record minimum in 2007. 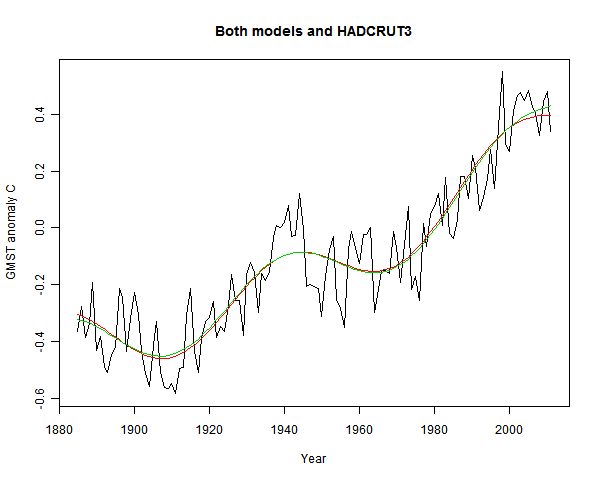 The greatest further melting in recent years (2006-) was in 2010; if we follow that pattern it will reach 3,357,000 sq km. IJIS is still melting - NSIDC has shown some refreezing, but that may change again. The TempLS analysis, based on GHCNV3 land temperatures and the ERSST sea temps, showed a monthly average of 0.48°C for August, up from 0.47 °C in July. After a rapid rise to April this year, TempLS has been steady, with a small downward drift. There are more details at the latest temperature data page. 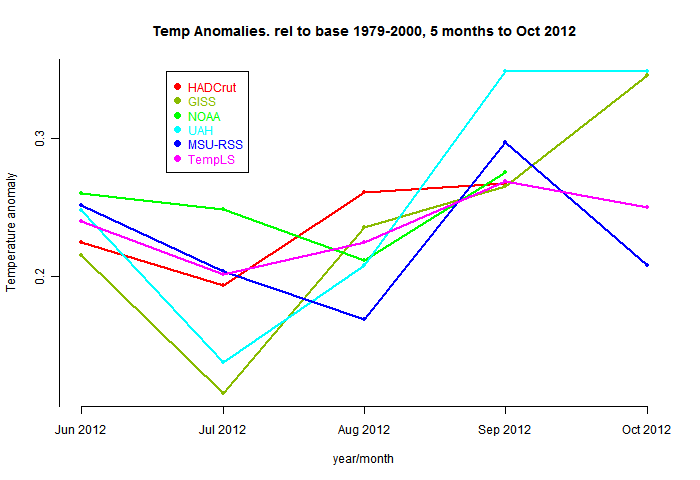 Below is the graph (lat/lon) of temperature distribution for August 2012. I've also included a count and map of the stations that have reported to this date, and a survey of the degree of error caused by my customary early reporting. Here is the map of "stations" which contributed to this report. Over half are SST readings from the ERSST grid, and generally all of these are available (subject to modification) from the start of the month. But numerous land stations haven't reported. There are a total of 4195; past months with more complete reporting have about 4500. I was curious to test the effect of incomplete data. I report earlier, and with less complete info, than the majors. This is partly to be first, but also so the calculation is a real test of TempLS's ability to independently assess the average. But I was curious to see what the penalty was. It isn't much. Here is a table of the difference between the originally posted monthly averages for 2012 and the current values, including the extra data that has come in since. I do believe in basic science. I believe in participating in space. I believe in analysis of new sources of energy. I believe in laboratories, looking at ways to conduct electricity with -- with cold fusion, if we can come up with it. It was the University of Utah that solved that. We somehow can’t figure out how to duplicate it. Well, of course Romney doesn't claim to be a scientist. It sounds like he's mixing up cold fusion with high temperature superconductivity. And I guess the last sentence is true. Anyway, I was curious to track down the source and context. It's from an interview Dec 7 2011 with the Washington Examiner. The transcript and video are here. It's on video part 2 (actually audio only) at about 5 min. The key plot is the one on the right. 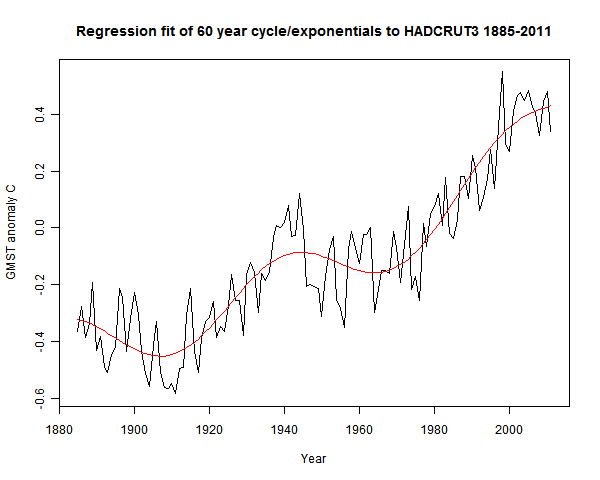 It's often been observed that a 60-year (or thereabouts) cycle plus a linear or quadratic does fit in this way. The question is, what does it mean? And in particular, can it be used for prediction? 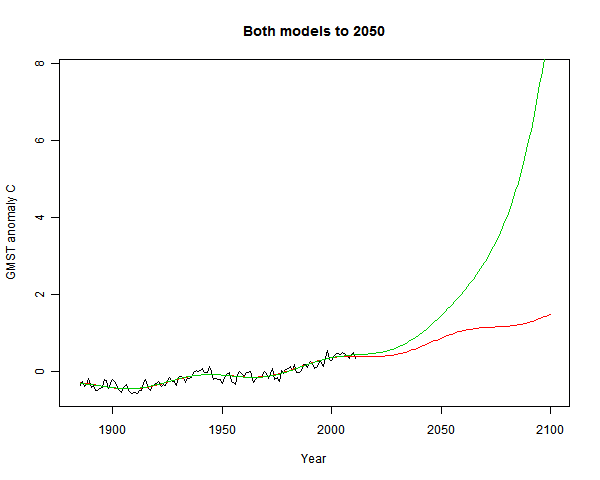 A model is only useful if it allows predicting future behaviour. I see no predictions by the author that could be later falsified by the real outcome. The model established a pattern as shown in Graph “f”. From this graph, It is easy to predict the climate if the pattern continues => Little warming in the next 15 years." So prediction does seem to be an aim. 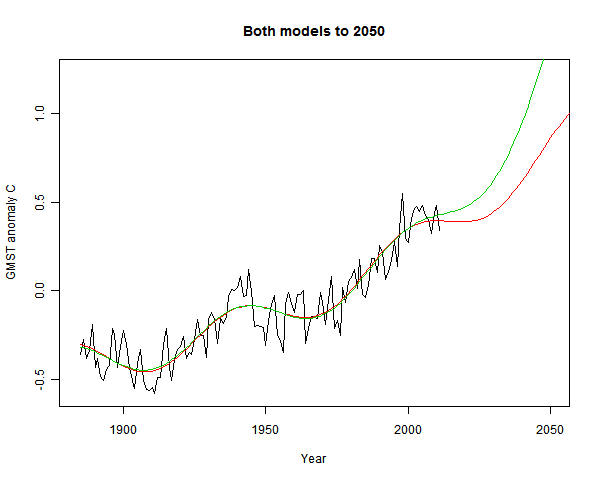 But looking forward to 2100, the exponential model (green) runs right away, warming by 8°C. Grim. The bind with fancy curve fitting is that it really can't be used much outside the range. And within the range, it isn't telling you anything you didn't already know, unless you are confident that you can make a useful deduction about the physics. So what about linear regression - very commonly used? Well, it isn't "fancy" curve fitting. But the underlying principle is there. If it is a time series, you need to be open to the possibility that there is a real underlying rate of change. Then regression (curve fitting) can estimate the rate for you. But it doesn't prove that the linear model is right.